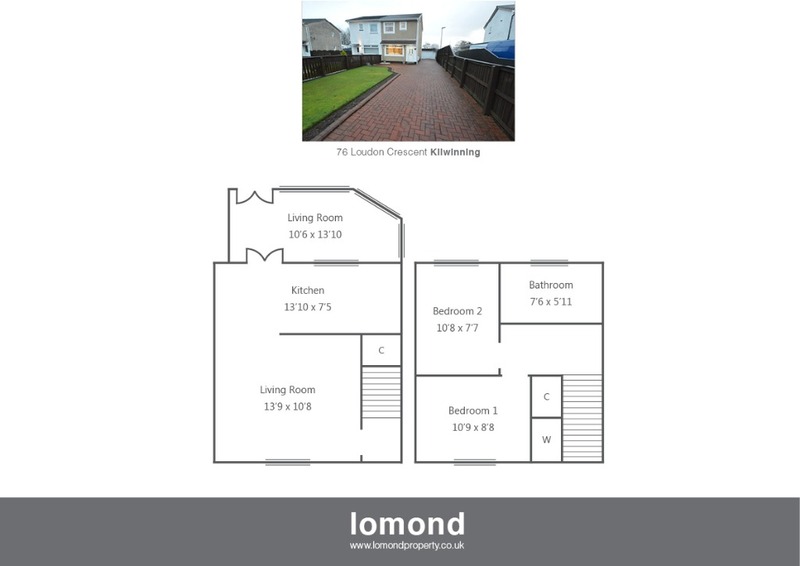 Situated in the ever popular Whitehirst Park area of Kilwinning, 76 Loudon Crescent is a modern semi-detached house. The property has two double bedrooms, conservatory and detached garage to rear. In summary the property layout extends to an entrance hallway with stairs leading to the upper level. The front facing lounge is spacious with modern décor and is open plan through to the kitchen. The kitchen is well stocked with floor and wall mounted units, gas hob, oven and hood. Access to the conservatory is gained via the kitchen. Externally the property has grounds to the front and rear. To the front there is a monobloc driveway providing ample off-street parking. There is also a small section of lawn. To the rear the garden features an astroturf lawn with perimeter fencing. The double brick-built garage has an electric shutter door and benefits from power and light along with gas central heating and plumbing. There is also a fully equipped engineer’s pit. Whitehirst Park is a popular residential area close to Kilwinning town centre. The town centre provides access to a range of amenities and local schools. Kilwinning also boasts good road and rail connections to other Ayrshire towns and Glasgow. On entering Kilwinning from the Pennyburn Roundabout (A738) continue past the fire station and through the mini roundabout. Take left at the traffic lights onto Whitehirst Park Road, take second left onto Prestonfield Avenue, then first right into Loudon Crescent. Number 72 can be found at the bottom of the cul-de-sac to the left.